Al Ain: His Highness Shaikh Mohammad Bin Zayed Al Nahyan, Crown Prince of Abu Dhabi and Deputy Supreme Commander of the UAE Armed Forces, on Thursday visited a number of tourist sites and housing and development projects in Al Ain. On the first leg of his tour, Shaikh Mohammad visited the Green Mubazzarah, a natural landmark located at the bottom of Jebel Hafeet offering natural hot springs. He then inspected the progress of work on a number of housing projects for UAE citizens. “Inspired by the legacy of the late Shaikh Zayed Bin Sultan Al Nahyan, President His Highness Shaikh Khalifa Bin Zayed Al Nahyan attaches great attention to the needs of citizens, an approach that has been embraced since the establishment of the UAE,” Shaikh Mohammad said. He stressed that the national issues and aspirations of Emiratis are given priority and are always at the core of the nation’s development progress. He inspected the Emirati housing development project at Jebel Hafeet that will include 3,000 housing units, covering an area of 4,535,000 square metres. The project includes world-class amenities, schools, health and leisure facilities and eight mosques located at the Western base of Jebel Hafeet. Shaikh Mohammad then visited Ain Al Fayda Lakes, and heard from official on relevant development projects and ideas being undertaken. He also visited the Shaikh Zayed Desert Learning Centre at Al Ain Zoo where he was greeted by Ganem Mubarak Al Hajiri, Director-General of the Al Ain Zoo and Aquarium Public Institution. 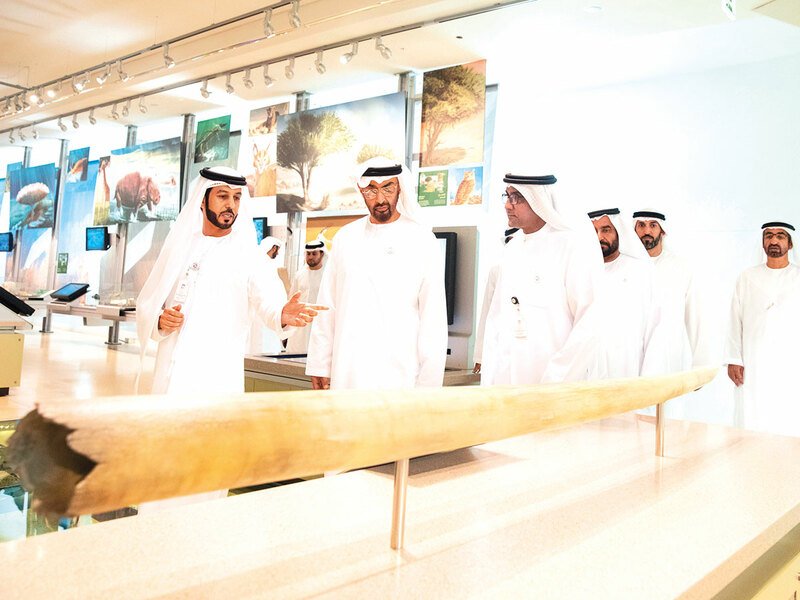 He toured the centre’s five interactive galleries - the Shaikh Zayed Tribute Hall, Abu Dhabi Desert Over Time, Abu Dhabi’s Living World, People of the Desert, and Looking to the Future. The galleries provide visitors a glimpse into a journey through time as stories and movies take them to the past, present and future of the UAE, to reconsider their relationship with the environment and encourage them to communicate with it and to adopt more sustainable lifestyles. Shaikh Mohammad was briefed by centre staff on the various programmes and activities that the centre engages in, including those that focus on the UAE’s heritage and national identity, its flora and fauna, and desert traditions. Accompanying Shaikh Mohammad were Shaikh Khalifa Bin Tahnoun Al Nahyan, Executive Director of the Martyrs’ Families’ Affairs Office of the Abu Dhabi Crown Prince’s Court, Dr. Ahmad Mubarak Al Mazroui, Secretary-General of the Executive Council of Abu Dhabi, Mohammad Mubarak Al Mazroui, Under-Secretary of the Abu Dhabi Crown Prince’s Court, and Mohammad Ali Alabbar, Chairman of Emaar Properties.